Welcome to part three of this series exploring every single film photography stock still being made today. I’ve covered 51 stocks so far and part three covers an additional 14, bringing our running total to 65 – the halfway point. If this is your first time here, I’d suggest you go and check out part one (ADOX to DUBBLEFILM) and part two (Ferrania to Hillvale). With regard to any uncredited sample images below, they are all my own and exist in one form or another as Daily Photos, or part of articles written by yours truly for this website. Ilford Photo is a UK manufacturer of photographic materials known today for its black and white film and papers and chemical. The company has produced photographic materials since 1879, making it one of the oldest photographic materials manufacturer in existence. It was the subject of a management buyout in 2005, resulting in the formation of Harman Technology Limited. The company also provides direct film development, scan and print services through its Harman Lab brand in the UK and US. ILFORD Delta 100 Professional is an ISO 100/21º fine grain black and white film that uses ILFORD’s Core-shell™ emulsion technology to deliver “superb image quality and maximum sharpness”. The film provides a wide exposure range and is recommended by ILFORD for exposure between ISO 50/18º and ISO 200/24º. It is available in 35mm, 120 roll film and sheet formats. The film is coated on an acetate base in 35mm and 120 formats, whereas sheet film variants are coated on a polyester base. Slow day Ilford Delta 100 Professional shot at EI 800. Black and white negative film in 35mm format. Push processed 3 stops. Shot on ILFORD Delta 100 Professional. Contax AX, Hasselblad Planar F 80 F/2.8. ILFORD Delta 100 Professional is an ISO 400/27º fine grain black and white film that uses ILFORD’s Core-shell™ emulsion technology to deliver “superb image quality and maximum sharpness”. The film provides a very wide exposure range and is recommended by ILFORD for exposure between ISO 200/24º and ISO 1600/36º. It is available in 35mm, 120 roll film and sheet formats. The film is coated on an acetate base in 35mm and 120 formats, whereas sheet film variants are coated on a polyester base. Attention: The internal data of table “173” is corrupted! 2016-08-02 – Rapids – Ilford Delta 400 Professional shot at EI 800. Black and white negative film in 35mm format. Push processed one stop. With a nominal sensitivity of EI 3200/36° and an ISO rating of 1000/31°, ILFORD Delta 3200 Professional is (currently) the world’s fastest black and white photographic film. The film is capable of producing images when exposed up to EI 25000/45°, although ILFORD recommends testing exposures at this speed to ensure suitable results. The film is recommended for available light photography in environments where flash photography may be inappropriate, unwelcome or not permitted. The film is available in 35mm and 120 roll film formats and coated onto a triacetate base. Attention: The internal data of table “172” is corrupted! Gallery coming soon. Additional samples available here. ILFORD FP (Fine grain Panchromatic) was first introduced in roll film format in 1935 and FP4 PLUS is its fifth iteration. FP4 PLUS is a fine grain ISO 100/21º black and white film available in 35mm, 120 roll film and sheet film formats. The film utilises a traditional grain structure and provides outstanding sharpness and an excellent capability for push processing, as the need dictates. In 35mm and 120 format the film is coated on a acetate base. In sheet format the film is coated on a polyester base. Read the ILFORD FP4 PLUS review. Attention: The internal data of table “174” is corrupted! Out for a stroll – Ilford FP4+ shot at EI 800. Black and white negative film in 120 format shot as 6×6. 2+2/3 stop push. Tuning forks – Ilford FP4+ shot at EI 125. Black and white negative film in 35mm format. ILFORD HP5 PLUS is an ISO 400/27º high speed, fine grain, medium contrast black & white film, making it an excellent choice for journalism, documentary, travel, sports, action and indoor available light photography. Nominally rated at ISO 400, HP5 PLUS produces negatives of outstanding sharpness and fine grain under all lighting conditions. It has been formulated to respond well to push-processing and according to ILFORS can be rated up to El 3200/36°. Read the ILFORD HP5 PLUS review. Attention: The internal data of table “175” is corrupted! Claw – ILFORD HP5 PLUS shot at EI 12800. Black and white negative film in 120 format shot as 6×6. Push processed 5 stops. ILFORD ORTHO COPY PLUS is a medium speed*, fine grain film for studio photography, continuous tone copying, medical and forensic applications. and studio use. ORTHO COPY PLUS can be developed to a normal contrast in ILFORD ID-11 or MICROPHEN and to a high contrast in ILFORD PQ UNIVERSAL and PHENISOL. the film is available in large format sheets and coated on an acetate base. Attention: The internal data of table “176” is corrupted! ILFORD Pan 100 and 400 black and white films are typically are only made available in selected markets and as such, can be difficult to find in North America and Europe. ILFORD Pan 100 is suitable for most general purpose indoor and outdoor photography applications (under good lighting) and is particularly suited to portraiture. The film is available in 35mm format (single cassettes and 100ft reels) and 120 format roll film, and is coated on a clear acetate base. Attention: The internal data of table “177” is corrupted! ILFORD Pan 400 is a fast black and white film ideal for action, available light and general purpose photography. It has fine grain for its speed and excellent contrast and sharpness combining to give excellent image quality. Both Pan 100 and 400 provide a high degree of exposure latitude, 1 1/2 stops under to as much as 5 stops over, making them easy and reliable to use in difficult lighting conditions. As with Pan 100, Pan 400 is available in 35mm format (single cassettes and 100ft reels) and 120 format roll film, and is coated on a clear acetate base. ILFORD PAN F Plus is an extremely fine grain ISO 50/18º black and white film. It has outstanding resolution, sharpness and edge contrast, making it the natural choice where fine detail and lack of grain are more important than film speed. Mural size enlargements from PAN F Plus negatives show an outstanding range of tone and detail when the film is carefully exposed and processed. Available in 35mm and 120 roll film formatss, the film is coated on an acetate base. Attention: The internal data of table “179” is corrupted! Ilford Pan F Plus shot at ISO50. Ilford Pan F+ shot at EI 800. 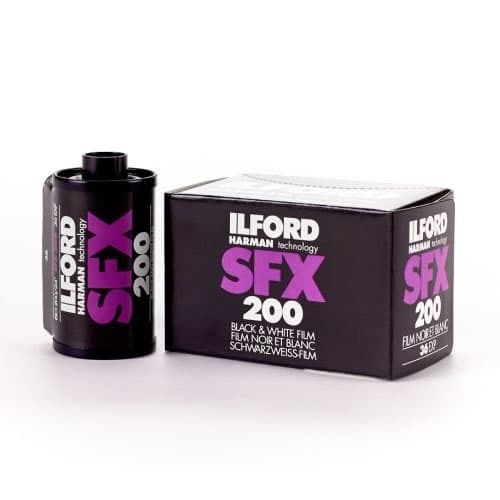 ILFORD SFX 200 is an ISO 200/24º medium speed black and white camera film with extended red sensitivity (up to 740nm). It is especially suited for use with a filter to create an infrared Wood Effect. the film can be used with conventional deep red (#25) filters, as well as specialised R72 (#87) filters to render skier black and green vegetation white. Unfiltered, the film can provide near-IR effects. Best results are often obtained in bright sunshine or in the studio under tungsten lighting. The film is available in 35mm and 120 roll film format and is coated on an acetate base. BT – Ilford SFX 200 shot at ISO25. Black and white infrared film in 35mm format. R72 filter plus two-stop push process. Going nowhere – Ilford SFX 200 shot at EI 6. Black and white infrared sensitive film in 35mm format. R72 IR filter. XP2 SUPER is an ISO 400/27º, sharp, fast, fine grain chromogenic black and white film, meaninng that it can be developed in a normal C-41 process along with colour negative films. It can be used for any photographic subject, but ensures excellent results when there is a wide subject brightness range. XP2 SUPER has improved exposure latitude compared with XP2, and gives exceptionally sharp, crisp prints. The excellent highlights and improved shadows of XP2 SUPER give enhanced negative contrast for optimum black and white print quality. Attention: The internal data of table “181” is corrupted! Ilford XP2 Super shot at EI 200. Shot on ILFORD XP2 Super at EI 400. Black and white negative film in120 format shot as 6×6. ClippedShot on ILFORD XP2 Super at EI 400. Kentmere 100 is an ISO 100/21º medium speed black and white camera film which is suitable for a variety of indoor and outdoor applications of photography where good lighting exists. The film is available in 35mm format in 24 and 36 exposure lengths, and in bulk lengths of 30.5m. Attention: The internal data of table “182” is corrupted! Kentmere 400 is an ISO 400/27º fast speed black and white camera film which is suitable for all aspects of general purpose photography and is capable of generating high quality images. The film is available in 35mm format in 24 and 36 exposure lengths, and in bulk lengths of 30.5m. Attention: The internal data of table “183” is corrupted! Japan’s most famous Leica obsessive and purveyor of cameras, Bellamy Hunt aka Japan Camera Hunter has been living in Tokyo since the early 2000’s. In 2016 Bellamy announced the launch of his JCH Streetpan 400 film in 35mm format, which was joined in 2017 with a 120 roll film version. More recently, Bellamy announced his intent to create a new, premium 35mm compact camera. Released in 2016 in 35mm format cassettes and in 2017 as 120 format rollfilm, JCKH Streetpan 400 is an ISO 400/27º black and white negative film originally used for traffic surveillance. The film exhibits an extended red sensitivity (into the IR range – 750nm), fine grain, excellent latitude and can be exposed 1 stop over, or 1/2 stop under without needing to change the film development scheme. The film is coated onto a transparent polyester base and can be developed both as a traditional black and white negative and as slides in a reversal process. Read the JCH Streetpan 400 review, or the JCH Streetpan Infrared review. Attention: The internal data of table “238” is corrupted! Straight down – JCH Streetpan 400 shot at EI 12. Black and white negative film in 35mm format. R72 720nm filter. Quite a small list considering what’s come before and what’s just around the corner but that’s no bad thing. Sometimes we need to take a bit of a breather. If you would like to share your own images (where missing above), please do so using the form linked in the section below. You can also use the same form to let me know about specific online retailers where the films can be purchased. Don’t be shy. Thanks to ILFORD and Japan Camera Hunter for use of respective product images. You’ll find links to them in their listings, so please go pay them a visit. Updated links and film count. Thanks for clarifying; I misunderstood that. Thanks for the whole series; this is really useful to have collected in one place. How did we get from Kentmere to Japan Camera Hunter without passing by Kodak, or will that be a chapter of its own? @ILFORDPhoto @Jpncamerahunter Thank you for this series of posts, they are very informative.